We’d love your help. Let us know what’s wrong with this preview of Dark Heart, Heavy Soul by Keith Nixon. To ask other readers questions about Dark Heart, Heavy Soul, please sign up. Konstantin is a killer. Ex-KGB, ex-FSB, now skulking in the shadows. He dresses like a tramp, bears a bitter grudge from his past life, always checks over his shoulder and rarely fights fair. He’s an excellent operations planner and is known in the worst kind of way to the British security services... who make one of those offers he can’t refuse to do a job he’d rather not. Konstantin is allocated a team; a killer woman with a skill-set to match his own, a bent corrections officer with a penchan Konstantin is a killer. Ex-KGB, ex-FSB, now skulking in the shadows. He dresses like a tramp, bears a bitter grudge from his past life, always checks over his shoulder and rarely fights fair. He’s an excellent operations planner and is known in the worst kind of way to the British security services... who make one of those offers he can’t refuse to do a job he’d rather not. I've read several ‘rogue agent’ rapid-fire romps recently, but this one does something innovative and daring within the constraints of the genre. Author Keith Nixon writes with panache and poise, in stylish stripped-down prose which evokes the atmosphere of a scuzzy pub in a few savage sentences. He keeps the reader guessing throughout; Konstantin himself doesn’t quite know what’s going on, we never know what he’s planning, and every chapter contains a new twist, a sudden setback or a breath-taking action set-piece. The language is littered with throwaway wit and snappy one-liners, while the WTF? aspects of the plot keeps the pages turning non-stop. This is a superior action-thriller, layered with flashbacks, intriguing characters and tendon-snapping sequences of graphic violence. Konstantin is a bad man, and his mythology draws on the best that the genre can provide including a secret hideaway and savage guard dog; a convenient fixer who comes up with guns, cars and a safe house when required, and a semi-friendly copper who can provide intel or turn a blind eye. But Nixon makes these familiar figures feel fresh and intriguingly unreliable; his writing has a real edge to it which imbues every exchange with the genuine potential for dangerous betrayal. A writer with considerable control of his craft, this one. I am absolutely yomped through Dark Heart and at the end was beset by only one concern: go back to the start of the series or look at what else Nixon has written? So today I’m reviewing book 4 in Keith Nixon’s Konstantin series. If you follow my reviews you’ll know I’ve read and enjoyed Keith’s work before and this certainly didn’t let me down. Konstantin is a brilliant character, with snip bits of information about his past being dropped throughout the book.. This made him a very intriguing character and likeable. His inner monologue had me smiling, he’s got this great sense of humour which I loved and as a reader I felt privileged to read his inner thoug So today I’m reviewing book 4 in Keith Nixon’s Konstantin series. If you follow my reviews you’ll know I’ve read and enjoyed Keith’s work before and this certainly didn’t let me down. Konstantin is a brilliant character, with snip bits of information about his past being dropped throughout the book.. This made him a very intriguing character and likeable. His inner monologue had me smiling, he’s got this great sense of humour which I loved and as a reader I felt privileged to read his inner thoughts. There was another character I particularly enjoyed.. Mr Lamb.. like Konstantin (or indeed any other character in the book) you don’t get to know too much about them.. the suspense this brings was great.. wondering what each characters motives truly were. In this latest offering from Keith Nixon we get some interesting insights into the Konstantin's past. As always Nixon weaves an intricate story filled with blood, violence, dark humour and a satisfyingly engrossing read. Highly recommended. Konstatin is an enigma wrapped in a mystery, inside a conundrum,and that is the key to following his intriguing saga. This is Keith Nixon’s fourth book featuring ex-KGB agent Konstantin Boryakov. While Konstantin is doing his best to lay low, trouble has a way of finding him. When it does then he’ll do what needs to be done, whatever that may be. All of the Konstantin books have been intense, edge-of-the-seat reads. I’ve found the character of Konstantin interesting in that in many ways he seems amoral, yet when you look deep, it’s apparent how untrue that impression is. What set Dark Heart, Heavy Soul apart fro This is Keith Nixon’s fourth book featuring ex-KGB agent Konstantin Boryakov. While Konstantin is doing his best to lay low, trouble has a way of finding him. When it does then he’ll do what needs to be done, whatever that may be. All of the Konstantin books have been intense, edge-of-the-seat reads. I’ve found the character of Konstantin interesting in that in many ways he seems amoral, yet when you look deep, it’s apparent how untrue that impression is. What set Dark Heart, Heavy Soul apart from the prior books in the series for me was that I was never sure it was going to turn out okay. Normally when you’re reading a book like this that is part of a series, while things may get tense, in the back of your mind you expect the protagonist to come out on top in the end. That he or she will survive is never really in question. But as this story unfolded, with its various twists and turns, I found myself seriously wondering whether Konstantin had finally gotten into a situation he couldn’t get out of in one piece. 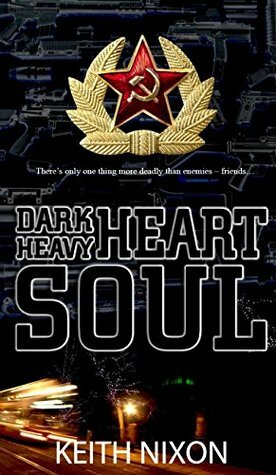 Even though Dark Heart, Heavy Soul is the fourth novel in the Konstantin series and there are a few characters from previous books, I do actually think it works well as a stand alone. Having read other books in the series, I feel like I know a little bit more about Konstatntin but nowhere near as much as I would like to. I don't think I have ever come across a character like him. He is surrounded in an aura of mystery and suspense and I am really dying to know more about his whole background and Even though Dark Heart, Heavy Soul is the fourth novel in the Konstantin series and there are a few characters from previous books, I do actually think it works well as a stand alone. Having read other books in the series, I feel like I know a little bit more about Konstatntin but nowhere near as much as I would like to. I don't think I have ever come across a character like him. He is surrounded in an aura of mystery and suspense and I am really dying to know more about his whole background and to the person he is today. I loved Violet and in some ways she is like the female version of Konstantin, though I don't think he would be to happy with me thinking that. Things are certainly never dull with her around. The book is made up of short chapters which makes the story feel quite fast paced and had me flying through it in no time. It is jammed packed full of action and there is quite a lot going on through out the story which left me feeling slightly exhausted by the end as I wanted to keep up with it all and not miss anything. Dark Heart, Heavy Soul is another good read in the series. Full of mystery with twists and turns, it certainly keeps the readers on their toes. The narrator, Konstantin Boryakov, started life as a bit player in ‘The Fix’ but this well-developed ex-KGB character has been elevated to a deserved series of his own – most of which I’ve not read. That is not a problem here as ‘Dark Heart, Heavy Soul’ reads well as a stand-alone novel. At first the staccato delivery of the first-person narration takes some getting used to as it acts as a barrier to shield the man from the reader just as he uses it to shield himself from life. But the rhythm soo The narrator, Konstantin Boryakov, started life as a bit player in ‘The Fix’ but this well-developed ex-KGB character has been elevated to a deserved series of his own – most of which I’ve not read. That is not a problem here as ‘Dark Heart, Heavy Soul’ reads well as a stand-alone novel. At first the staccato delivery of the first-person narration takes some getting used to as it acts as a barrier to shield the man from the reader just as he uses it to shield himself from life. But the rhythm soon begins to pulse through the blood, and the depth of his character, his emotional back-story, and his moral compass, all rise to the surface to add perspective to the tale. A wild, suspenseful adventure with a cast of complicated and yet (worryingly) relatable characters, this is great fiction. Konstantin is living a (relatively) peaceful existence when a woman with a penchant for fights and an adversary from the past lead him into an impossible dilemma: break into a secure cash facility to steal an unknown item ... or die. And that's just the beginning. Pacy, sharp, and witty, this is a relentless ride into the recesses of, well, dark hearts. The characters were ve A wild, suspenseful adventure with a cast of complicated and yet (worryingly) relatable characters, this is great fiction. Pacy, sharp, and witty, this is a relentless ride into the recesses of, well, dark hearts. The characters were very well drawn, with depth and multiple shades of decency depending on the situation. Realistic and absorbing, this is a great read. Highly recommended. Nixon continues his most prominent character's story in this stand-alone instalment. The punchy, economical writing structure which has become the character's signature narrative style is present, as is the acerbic wit regular readers have come to expect. Another solid novel to add to Nixon's bulging portfolio. Keith Nixon builds yet more bricks onto the solid foundation of his most famous creation. He's perfected the short, sharp prose and snappy dialogue that comes with this series by now, and it's all the stronger for it. My favourite of his Konstantin books, after his flawless debut, The Fix. Five easy stars. Another enjoyable romp with the mysterious Russian, Konstantin.